Thornton Wilder’s Our Town follows the small town of Grover’s Corners through three acts: “Daily Life”, Love and Marriage”, and “Death and Eternity”. Narrated by a stage manager and performed with minimal props and sets, audiences follow the Webb and Gibbs families as their children fall in love, marry, and eventually—in one of the most famous scenes in American theatre—die. 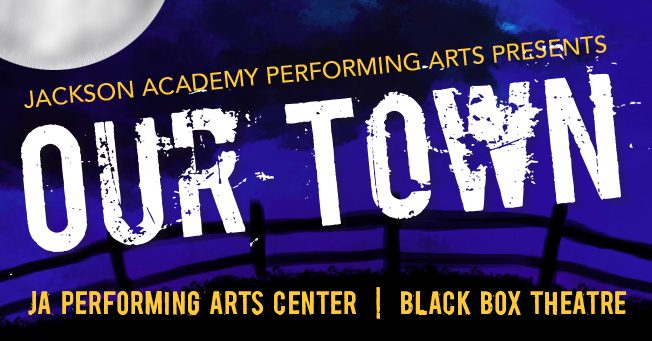 Our Town, presented by the Jackson Academy Performing Arts Department, begins in April. Four different performances of the production are scheduled for April 16, 17, and 18, at 7:00 p.m. and on April 19, at 2:00 p.m.
To purchase tickets to Our Town, visit japac.tixato.com/buy/our-town–3 or click one of the links below. Tickets will also be available at the door. Thursday, April 16 at 7:00 p.m.
Friday, April 17 at 7:00 p.m.
Saturday, April 18 at 7:00 p.m.
Sunday, April 19 at 2:00 p.m.